Kinston, NC Bojangles'® Tands, INC. Store #7 - Bojangles'® / Tands, Inc.
Halfway between Raleigh and the North Carolina coast, this Kinston Bojangles’® is conveniently located to refuel on your trip to or from the beach! Fill your stomach with our tasty chicken ‘n biscuits and refuel your tank at the Rightway Gas Station next door. 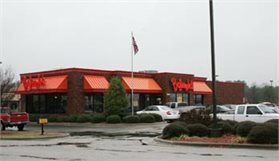 We remodeled this Bojangles’® in 2011, and you can always expect clean facilities, friendly service and great food. For a delicious breakfast, lunch or dinner, Kinston chooses Bojangles’®! Our Kinston, NC patrons love the crispy, Cajun-style fried chicken, fresh buttermilk biscuits and southern-style fixin’s on the Bojangles’® Menu.